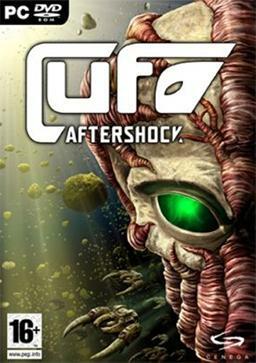 UFO: Aftershock system settings menu. Locked at 1024x768. See Widescreen resolution for fix. Go to the installation folder and create a backup of the original UFO.exe. Open archive and extract files from selected resolution into installation folder. Overwrite when asked. Currently supported resolutions are 1600x900, 1680x1050 and 1920x1080. Sometimes this fix will cause game to render partially off screen. See Off screen rendering fix bellow. Delete or rename widescreenmod.vfs file and Profile folder. Backup your saves if necessary. Run original UFO.exe, create new profile and set your options. Apply widescreen fix again and run the game. You can keep both original exe and fixed exe in same folder, but you have to delete or rename widescreenmod.vfs because original version will load this file as well. Replace Aftershock's default desktop shortcut with the one from its Start menu folder (probably ...\Cenega Czech\UFO Aftershock), reading "High Quality" or something to that effect. 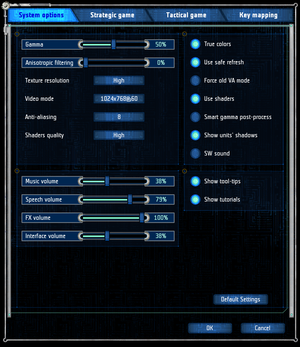 Manually force 16x AF from your graphics card settings. The resulting sharper textures and (consequentially) more detailed gloss maps add up to a significant increase in the overall visual experience, compared to "vanilla" game. ↑ 2.0 2.1 File/folder structure within this directory reflects the path(s) listed for Windows and/or Steam game data (use Wine regedit to access Windows registry paths). Games with Steam Cloud support may store data in ~/.steam/steam/userdata/<user-id>/289500/ in addition to or instead of this directory. The app ID (289500) may differ in some cases. Treat backslashes as forward slashes. See the glossary page for details. This page was last edited on 15 December 2018, at 04:44.